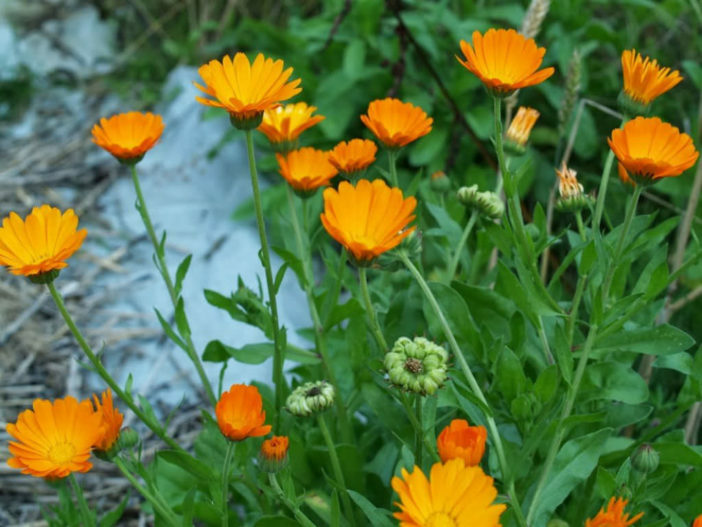 Whether displaying bright orange or sunny yellow flowers, Calendula (also called Pot Marigold) is one of the most essential parts of your garden medicine chest. The aromatic heads of these spring flowers can be collected and made into oils and salves to help heal skin injuries of all kinds. Make sure you grow only Calendula officinalis and not just any of the many marigolds or ornamental varieties that are available. Read on to learn the specifics for growing and caring for these delicate and beneficial flowers. Calendula can grow to almost 2 feet (60 cm) tall, and the flowers tend to open with sunny, dry weather and close in cold or moist conditions. They enjoy full sun (or even partial shade in hot summer regions) and average soil, and have moderate water needs. If flower production dwindles, you can cut back the plants to increase new flower production. Calendula will self-sow yearly in many gardens and don’t mind crowding. Direct-sow the seeds in early spring or late fall, as they can withstand some frost. Collect the flower heads on hot, sunny days for the highest resin content, and pick them regularly to prevent the plants from putting their energy into seed production. Once that happens, the rest of the flowers will be smaller. Choose flowers that are just opening in the morning before noon, and dry Calendula quickly after you harvest it. Check the center of the flower for dryness because molding in storage is a problem. Watch for reabsorption of moisture and keep it in complete darkness. Use the freshly dried flower heads to make creams, salves, liniments, teas, tinctures, and oils, or add the flower heads directly to your bath to soothe irritated skin. For internal conditions, take 1 to 3 dropperfuls of tincture in a little water several times daily (though be sure to check with your healthcare professional first). As with other members of the Daisy family, some people are sensitive to Calendula because of the sesquiterpene compounds that the plants contain. If you tend to have allergic skin reactions or are sensitive to certain foods, start with a low dose of this herb and work up to a full dose if you don’t experience any reaction.